Cornering like a madman. Celebratory donuts. Wearing scorpion jackets. Driving has its high points. Looking for street parking, however: low point. 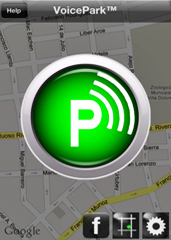 Introducing VoicePark, a hands-free iPhone app/parking executive assistant that will tell you, out loud, where the closest vacant parking spot will be, available now. Think of VoicePark as Siri’s weird little parking-obsessed sister: the app taps into the city’s new $20 million parking sensor system to verbally direct you to open spots, turn by turn. You’ve lived the nightmare: driving slowly in circles looking for a place to put your car, angrily eyeballing other cars that you think are looking at your spot. But now, once you’re close to where you’re going, you’ll tap the green button, turn up the volume on your phone and let Ms. VoicePark direct you to a spot (it updates every eight seconds to ensure you get the best space, or reroutes if the space is already taken). Right now, you’ll have access to 19,250 metered parking spots in the city. Basically, any part of the city that has the new smart meters (including: Mission, Marina, Hayes, Fillmore, FiDi and SoMa). And by summer’s end, you’ll have access to the city’s 75,000 spaces—even at unmetered spots. One thing: she gets really cheerleaderishly excited when she finds you a spot. Somehow it plays into building parking karma.